Hall of the Mountain King: Stuck in My Head: "Dimebag" Darrell Abbott, "Whiskey Road"
Stuck in My Head: "Dimebag" Darrell Abbott, "Whiskey Road"
Unlike many passed artists, “Dimebag” Darrell Abbott doesn’t seem to have left behind much unreleased material. Either that or his family is being very careful with what they let out. But every now and then, something we haven’t heard before trickles out. A while back, Guitar World premiered the track “Whiskey Road,” recorded on Pantera’s final tour in 2001. 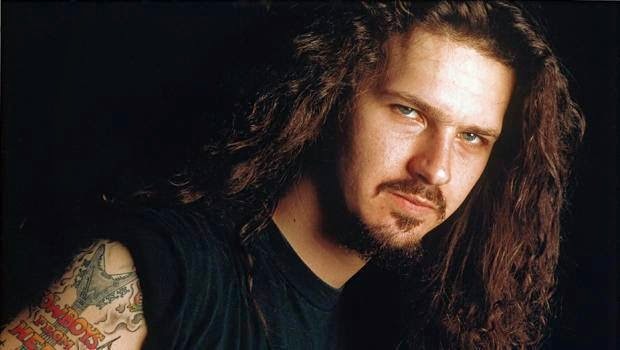 The song features the late Dimebag on all instruments and vocals, and though it’s a rough demo, it shows a lot of promise. If you’re expecting a crushing Pantera tune, think again. “Whiskey Road” is a Southern rock drinking song from start to finish. Though there’s a little bit of “Cemetery Gates” in the clean guitar sound and some of the leads, there’s a lot more twang than crunch. The first thing that has to be said is that Dimebag’s vocal skills don’t match his guitar skills. His voice is, by a long shot, the weakest part of this song. That said, you also have to take it for what it was — a demo. Had the song actually been recorded for release, it probably would have changed drastically with other musicians and another vocalist getting involved. “Whiskey Road” seems to be a track tailor-made for Dime’s Rebel Meets Rebel project with David Allan Coe. I can almost hear Coe’s version in my head when I listen to it, perhaps with Pantera vocalist Phil Anselmo doing the occasional spoken vocals that are in the background. It could have been a really strong piece of a second record from that project — if it ever happened. But the vocals aren’t going to be the focus of the song for most fans. It’s going to be Dimebag’s guitar work, and that’s interesting as usual. Much of the lead work is done with a slide, but with effects on it that make you wonder if he’s using a slide or doing it some other way. It’s got Southern twang, but also a bit of a spacey feel. The song ends with some extended noodling from Dime. There are some of those trademark whammy bar swells that he used so often, but the jam session with himself pays homage to some influences that you didn’t often hear in his released music. Lynyrd Skynyrd practically drips off of some of the licks, there’s a little taste of Jimmy Page in it, and he throws in a few Billy Gibbons-like harmonic squeals, too. “Whiskey Road” probably won’t stand as a lost gem for most fans. It’s a rough Dimebag song that needs a lot of work, but it also shows a great deal of potential. For me, it’s a bittersweet listen when I imagine what the song could have been turned into with the right personnel and a little polish.